Samsung Russia has announced its new Samsung C3510. Samsung C3510 is a budget full touchscreen phone which has been enhanced to support wide range of social networking services such as Facebook, Twitter and etc. 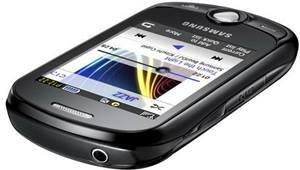 The Samsung C3510 is featured with a 2.8-inch QVGA touchscreen display with 240 x 320 resolution. The phone is also equipped with a 1.3-megapixel camera with digital zoom. It has built-in 30MB of internal memory, support web browser, integrated with FM radio, a music player and video playback which supports MP3, AAC, AAC+, eAAC+, WMA, AMR , MPEG4 and H.263 formats. In addition, it is Bluetooth enabled, supports up to 8GB of MicroSD card and comes with a 960 mAh Li-on battery that provides up to 10 hours of talk time and 720 hours of standby time. The Samsung C3510 with dimension of 4.09 x 2.18 x 0.51 inches and weighs 92g is expected to be available in Russia by late of January. It is priced at about USD 200.